From basic kitchen essentials to cutting edge devices, these tools will help you become a culinary master in the new year. 1. A cutting board with built-in prep containers to help bring your mise en place game to the next level. 2. A set of knives that are super sharp, both literally and figuratively. This 18-piece set includes a paring knife, chef's knife, bread knife, steak knives, a sharpening steel, and more. Get it from Amazon for $80.99 or Walmart for $80.99. 3. A set of six porcelain ramekins to help you perfect your favorite creme brûlée or soufflé recipe. 4. An herb stripper so you can stop using that dried stuff and actually get some fresh herbs in your life. Get it from Amazon for $5.53. 5. A mandoline with multiple thickness settings so you can slide your way to razor-thin veggies (and more!). It comes with multiple blades so you can get straight cuts, wavy cuts, or julienne strips, depending on what you're going for. Get it from Amazon for $39.95 or from Walmart for $39.09. 6. A fish turner that will work so much better than your regular spatula when it comes to flipping fish without them falling apart. Get it from Amazon for $12.99 or from Jet for $12.99. 7. A genius peeler with three different blades — standard, serrated, and julienne — making it easier to hold than a normal knife and much more compact. Get it from Amazon for $12.47. 8. 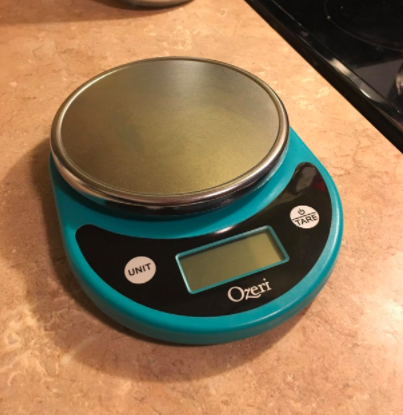 A quesadilla maker featuring a non-stick surface so you won't have to worry about struggling to get it clean if some cheese oozes out of your tortilla. 9. A set of measuring cups, plus mixing bowls, that'll all stack together to help you save storage space. Comes in either multicolor or blue. 10. A grill pan, so you can still make delicious grilled recipes even if you don't have the outdoor space for an actual large grill. 11. 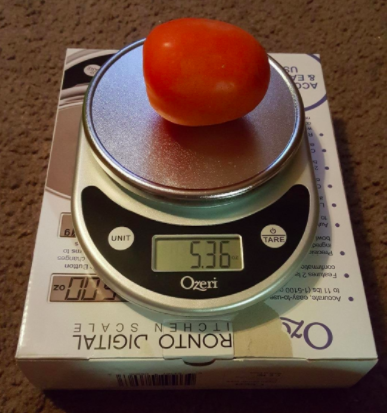 A digital scale that will allow you to be more precise than ever with your measurements. Get it from Amazon for $10.11 or from Walmart for $10.11. 12. An egg separator to keep yolks and whites apart without requiring you to strain them with your fingers. Plus it's pretty darn cute! Get it from Amazon for $5.89 or from Jet for $5.54. 13. A pair of tongs that will provide a solid grip for turning and grabbing food as you cook. Get it from Amazon for $14.95 or from Jet for $18.95. 14. A pair of fine tongs if you're looking to get super fancy with your plating technique, because as any fan of Chopped knows, presentation counts! Get them from Sur La Table for $33. 15. A meat thermometer so you can stop cutting halfway through your meat to check if it's fully cooked or not. 16. A whisk designed to be comfortable when you're using it for long periods of time. And it has a non-slip grip! Get it from Amazon for $9.99 or from Jet for $9.99. 17. A name-brand Dutch oven made of enameled cast iron that is also dishwasher-safe! Get it from Williams Sonoma for $99.95+. 18. A skimmer that will take that weird foamy top off of your soups, because no one wants to eat that tbh. Get it from Amazon for $13.07. 19. A sous vide precision cooker that will let you determine the exact water temperature you want to use to cook your meal. 20. A miniature food processor to chop and puree like no one's business. Get it from Amazon for $39.95 or from Walmart for $39.95. Available in 16 colors. 21. A non-stick silicone baking mat that you won't need to slather in oil or butter to ensure that your delicious baked goods don't get stuck on the pan. 22. A crepe maker with a batter spreader for perfectly thin crepes every single time. Plus, you can also use the surface as you would a typical griddle to make all kinds of breakfast foods. Get it from Amazon for $69.99 or from Walmart for $69.99. 23. A potato masher for anyone who knows that mashed potatoes >>> baked potatoes. Get it from Amazon for $11.95 or from Jet for $11.99. 24. A wok for an incredible stir fry whenever you feel like it. Get it from Amazon for $49.96. 25. A double boiler so you can use the power of steam to enhance your culinary creations. Get it from Amazon for $27.75. 26. An egg poacher that will keep the whites from separating. Because you deserve to finally make that perfect poached egg. Promising review: "Great pan. As others have mentioned, it is easy to clean up, cooks the eggs very quickly, and can also be used as a rice cooker without the insert. Construction is solid and the handle has a nice shape, making it easy to maneuver." —Ann D.
27. An enameled cast iron fondue pot you will definitely be fond of. This 11-piece set comes with six forks, a splatter ring, a wooden base, and more — and is perfect for both meats and cheeses. Comes in four colors. Get it from Amazon for $59.99+. 28. A seafood cracker you'll want for all the summer clambakes you'll be hosting to show off your culinary abilities. Plus, you can also use it to crack nuts! Get it from Sur La Table for $14.95. 29. A hand mixer that will whip your ingredients into shape in no time. Get it from Amazon for $31.99. Available in 12 colors. 30. A splatter guard to prevent your stove, countertops, and clothing from the wrath of hot grease and oil. Get it from Amazon for $28.95 or from Walmart for $31.97. 31. A burger press, because perfectly formed patties are a thing of beauty. 32. 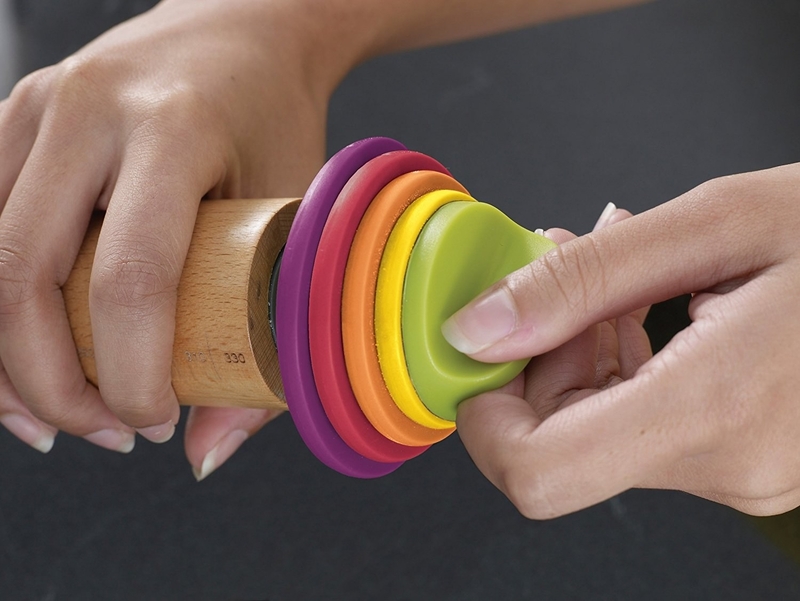 A rolling pin you can adjust to make sure your dough is always the exact thickness you want. Get it from Amazon for $17.03 or from Walmart for $22.19. 33. A pair of poultry shears that will have you crying fowl, not foul. 34. A 4-liter deep fryer with easily adjustable temperature settings, because let's be honest — everything tastes better fried. It comes with one large and two smaller baskets, so you can fry up as much or as little of something as you want. Get it from Amazon for $54.50. 35. A clip-on strainer so you can say goodbye to the days of accidentally dropping pasta into the sink. The flexible design is meant to help fit the strainer to all sizes of pots and pans. Get it from Amazon for $15.99 or from Jet for $12.99. 36. A citrus squeezer that will let you stop worrying about seeds mistakenly finding their way into your meal. 37. A microplane perfect for shaving and grating cheese, chocolate, and so much more. Get it from Amazon for $14.04 or from Walmart for $14.04. 38. A spiralizer that'll create perfect veggie noodles every time so you can enjoy healthier versions of your favorite pasta dishes. Get it from Amazon for $37.99 or from Jet for $39.99. 39. A cherry/olive pitter so you can pop 'em right in your mouth and not worry about biting down on those hard pits. Get it from Amazon for $12.95 or from Jet for $12.99. 40. An onion holder that'll prevent that darn onion from rolling off the cutting board and onto the floor, and give you the even slices you deserve. Get it from Amazon for $10.87 or from Walmart for $10.87. 41. A mortar and pestle to use when you want hand-ground herbs, spices, and more. Get it from West Elm for $15. 42. And a copper cocktail set you can use to create a refreshing after-dinner indulgence. Spending time in the kitchen will be nothing short of a party after getting these products.